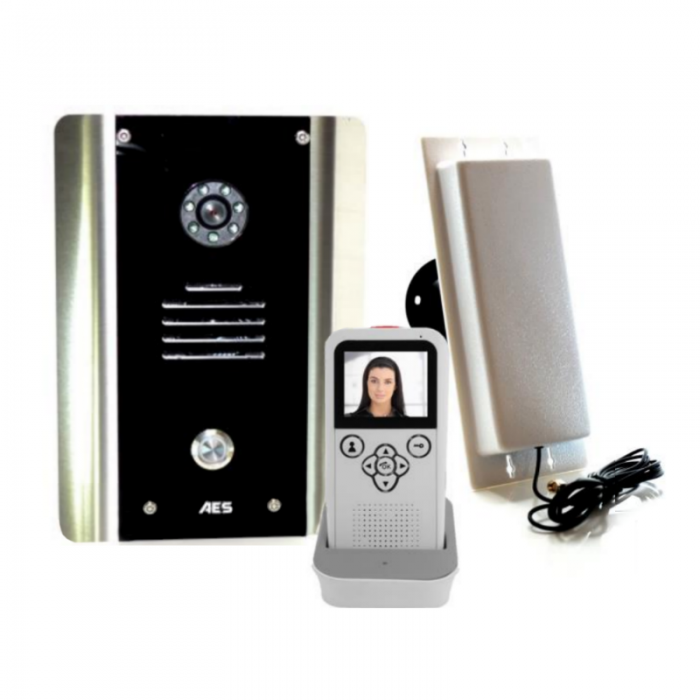 Digital D.E.C.T wireless intercom system for flats, apartments or shared gate entrances. Up to 4 call buttons, each button calling a different handset. Working range of 100 metres through concrete, up to 400 metres open field conditions. 1 handset per property or apartment. Now available with 2 relay outputs. 12-24 ac/dc power supply range (CAT5 alarm power cable friendly). Now available optional range extending antenna. Keypad option for coded access. Built in voicemail feature for missed callers, user can listen to messages on handset. Modern blue back lighting effect. BS316 marine grade, brushed stainless steel construction with gloss acrylic trim. Kit includes speech panel, antenna, power supply, handset, charging base, charger and installation manual. If you're looking for an installer to automate existing gates or install aluminium gates from our Stargate range, please fill in the form below. The more information you can give us at this stage will help us to get the right installer for you. They wil contact you directly and discus your requirements. Trade Installer or Home Owner? Linkcare provides trade discount accounts for gate automation and access control installers and engineers. We do not advertise trade discounted prices to the public. The only way to see reduced prices in the Linkcare shop is by logging in with an installer account username and password. You can then search for, compare, and buy any products online at the reduced trade prices. You can also add products into wish lists for preparing quotes. We protect your trade prices to prevent home owners from buying gate automation and access controls, and then asking you to install it. Some wholesalers sell to anyone at trade discounted pricing. This allows them to sell well, but it potentially reduces what you can earn from each installation job. We want to ensure that qualified and trusted gate automation and access control installation professionsls are responsible for all gate automation installation so that each one is as safe as it can be. Apply for a trade discount here or log into your trade account to see trade discounted pricing here. L- FabKit 2 24Vdc underground gate motor kit for automating swing gates up to 4mReliable and resista.. High-Speed swing gate kit for swing gates with leaves up to 4m, Ideal for intensive use and quick ma..
SPECIAL OFFER - Nice RobusKit 400 24Vdc kit for a sliding gate up to 400KgThe Kit Contains:	1 x RB40..
TAKE ADVANTAGE OF OUR SPECIAL OFFER NOW ! !Toona5024HS Kit 24Vdc ram kit for swing gates up.. The kit contains:2 MT/71NB 24 Vdc sealed operators2 CF/77 foundation boxes in polypropylene reinforc..
SPECIAL OFFER - Linkcare 24Vdc LED traffic lights - buy two and save nearly £130! Price for 1 LED traffic light is £214.00 inc VAT.Price for each LED traffic lights if you buy two or..